Among three leading social networking platforms—LinkedIn, Twitter, and Facebook—LinkedIn is the most effective source of leads for B2B companies, according to data from HubSpot. 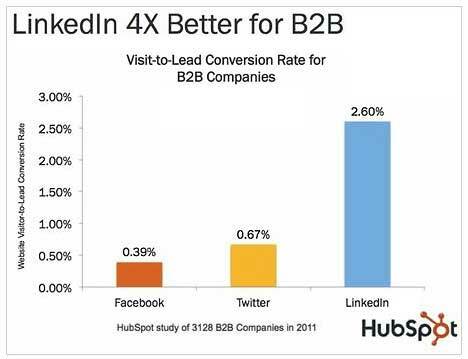 In a study of 3,128 HubSpot B2B customers in 2011, LinkedIn generated a visitor-to-lead conversion rate of 2.60%, on average. That's four times higher than the average visitor-to-lead rate for Twitter (0.67%) and seven times higher than the average rate for Facebook (0.39%).